In Barbados, Say “What??? ?” If You Love Me. Greg and I are a happy couple here in Barbados. We laugh, we play, we talk (and usually communicate). We swim almost every morning and almost every evening in the brilliant blue, very warm Caribbean Sea that is our backyard here at the St Lawrence Beach Condos. And that’s what I blame some of our conversations on: the salt air of the Caribbean Sea. It gets into our brains and, um, scrambles things. Saturday evening Greg’s son Dean sent us a photo of himself dressed for a Halloween party he and his wife Erin were throwing at their home in Toronto. 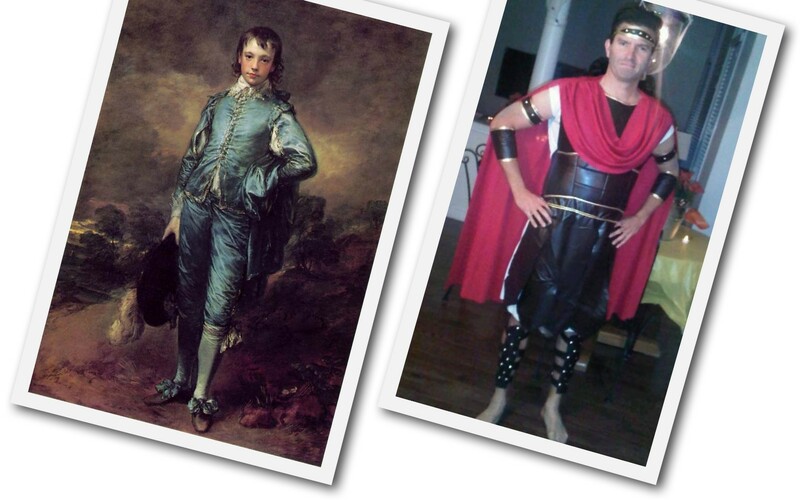 In discussing Dean’s Halloween costume it occurs to me that Greg and I must’ve drunk swum quite a lot that day …. 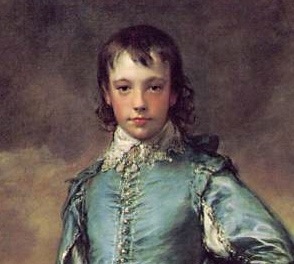 Gainsborough's "The Blue Boy" and Dean as gladiator. Hm, maybe Greg's and my conversation made some sense after all. Yes, that’s our problem … the salt air. That’s my story and I’m sticking with it.